In this study we attepted to detect the potential antibacterial effects of the widely prescribed members of the purine group - caffeine and theophylline (in the form of aminophylline). These compounds were tested against several pathogenic bacteria. Seven strains of bacteria were clinically isolated from patients (30-38 years of age) with respiratory and gastrointestinal tract infections at AL-Hussein General Hospital of Karbala province. Throat swabs and stool samples were cultured on Mueller-Hinton agar (HiMedia, Mumbai, India) and incubated at 35°C for 24 hours. In addition to gram-staining and morphological criteria, we used the API-20 system (Biomιrieux, Netherlands-France) to identify the bacterial species. For further confirmation, the isolates were sent to the bacteriological bank of the College of Science, University of Basraha, Iraq. The isolated strains (one strain for each species) included two species of gram-positive bacteria (S aureus and Bacillus subtilis) and five species of gram-negative bacteria (E coli, Enterobacter aerogenes, Enterobacter cloacae, Salmonella More Details typhi, and Paracoccus yeei). Caffeine and aminophylline were purchased from HiMedia, Mumbai, India. Ampicillin sodium and cefotaxime sodium were supplied by KonTam Pharmaceuticals Co. (Zhongshan, China). 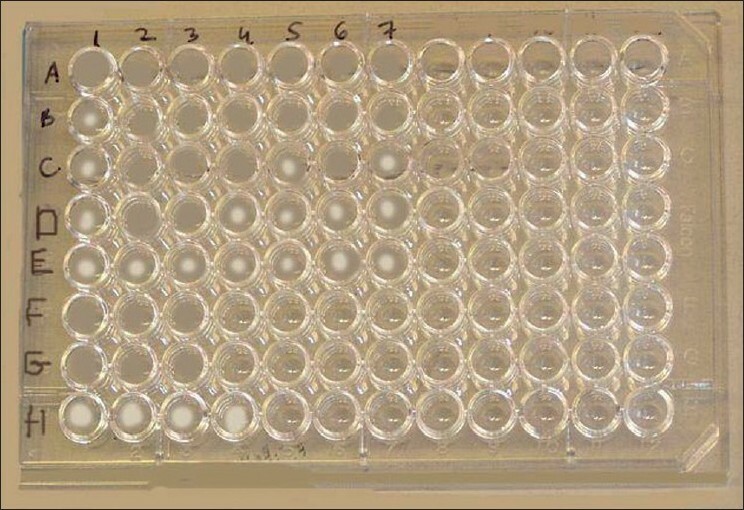 For antibacterial assay, total count of isolated strains were standardized to equivalent a 0.5 MacFarland Nephelometer standard (1 Χ 10 8 cfu/ml) by Mueller-Hinton broth (HiMedia, Mumbai, India) and then diluted as 1:10. Ampicillin sodium and cefotaxime sodium were dissolved in sterile distilled water to prepare concentrations of 20, 39, and 78 μg/ml. Both of these drugs and media without any added chemicals were used as controls. Determination of minimum inhibitory concentration (MICs) were determined by the microdilution method recommended by the NCCLS. Briefly, the tested chemical agents were two-fold diluted in Mueller-Hinton broth. A volume of 100 μl of each dilution was dispensed into the wells of 96-well microdilution plates. The filled well was inoculated with 50 μl of previously prepared of standardized count of bacteria. The inoculated trays were incubated at 35°C for 24 hours and examined for visible growth in order to determine the MIC. Three previous controls were also included. Each experiment was repeated three times with triplicates of each concentration. The data were statistically analyzed using two-way analysis of variance (ANOVA) with least significant difference (LSD) at P<0.05. The purine compounds caffeine and aminophylline were investigated at various concentrations for antibacterial effects against seven strains of bacteria using the spectrophotometer method. B subtilis was found to be more susceptible to the tested purines than the other species of bacteria. The growth rate of six of the seven strains of bacteria (the exception being Staphylococcus aureus) significantly decreased in the presence of a high level of aminophylline (10mg/ml). S typhi and B subtilis needed only 5mg/ml of aminophylline to reduce their ability to grow in culture media [Figure 1] and [Figure 2] [Table 1]. 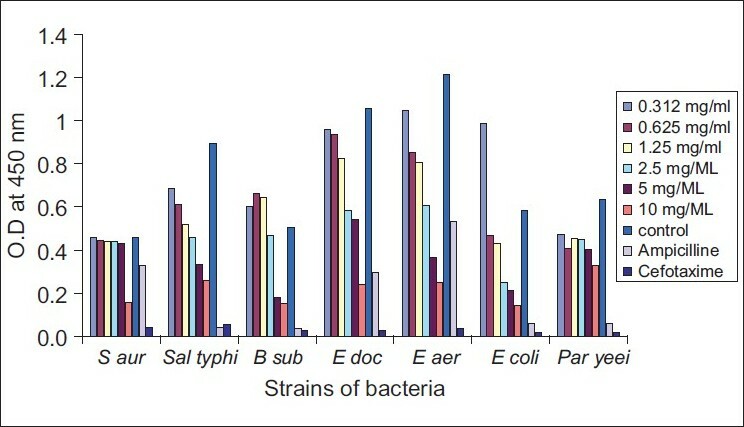 As [Figure 3] shows, bacterial strains exhibited more variable susceptibility to different concentrations of caffeine. The gram-positive bacteria, S aureus and B subtilis, were more susceptible to the action of caffeine than the gram-negative bacteria. The turbidity of the broth culture of Paracoccus yeei, and the elevated optical density ratio, pointed to a very clear resistance to the toxic action of caffeine. Statistical analysis showed that the purine compounds had significant effect (P<0.05) in reducing the growth of Paraccocus yeei [Figure 2] and [Figure 3]. The efficacy of aminophylline in decreasing bacterial growth (as compared to growth in the control media) was significantly more than that of caffeine. Caffeine and aminophylline, at concentrations of 10 mg/ ml, revealed greater ability to inhibit most of tested strains (especially S aureus, E cloacea, and E aerogenes) than the standard antibiotic ampicillin, which was used as a control. However, cefotaxime showed greater effect on the isolated bacteria than the purine compounds [Figure 2] and [Figure 3]. Caffeine and theophylline are important purine compounds for human beings as large amounts are consumed daily in foods, beverages, and drugs. Theophylline is still commonly prescribed in the treatment of asthma and chronic obstructive airway disease because it is inexpensive. The similarities between purine alkaloids and nucleic acids in structure encourage the use of these compounds as antimicrobial agents. The results of this study revealed that high concentrations are required for an antibacterial action, with aminophylline proving to be much more effective than caffeine against the bacterial isolates. In contrast, Raj and Dhala  reported that caffeine at concentrations up to 5mg/mL had more antibacterial activity than theophylline. In the present study, some strains of bacteria, including S aureus and P yeei, exhibited resistance to both purine compounds. Hosseinzadeh et al. also recorded such resistance to caffeine and aminophylline after culturing S aureus and P aerogenosa in media containing these compounds. Antimicrobial drugs act in one of several ways: by selective toxicity, by inhibition of cell membrane synthesis and function, by inhibition of protein synthesis, or by inhibition of nucleic acid synthesis. Resistance to cephalosporins had been observed in many strains of bacteria due to the production of a stable cephalosporinase. This enzyme is related to the β-lactamase group that is expressed by plasmids. It is considered the most important mechanism of development of drug resistance in Enterobacter strains. However, the E cloacea and E aerogenes that showed resistance to ampicillin in the present study were found to be susceptible to the purine compounds. A previous study has shown that purine compounds have both in vitro and in vivo efficacy in inhibiting a special group of skin pathogenic fungi (dermatophytes). Recent data suggests that these compounds also have inhibitory activity on other groups of microorganisms such as bacteria. These results indicate that purine agents, with their ability to destroy different types of pathogenic organisms, may be promising drugs for treatment of many diseases. Judging on the basis of their pharmaceutical characteristics, caffeine and aminophylline have the potential to be useful drugs for treatment of bacterial infection. The beneficial characteristics include the following: these compounds are toxic to humans only at relatively high concentrations;  the mode of action in microorganisms is suspected to be an interaction with the nucleic acids of the pathogen; ,, development of resistance in microorganism to these purine agents arises slowly because of usage of high concentrations of the drug; few adverse effects are associated with administration of these agents;  caffeine and aminophylline are inexpensive drugs, so large numbers of patients can be benefitted. Most of the known antibacterial drugs lack one or more of these characteristics. Thus, caffeine and aminophylline have the potential to become one of the prefered drugs for treatment of bacterial infection. The purine compounds demonstrated potential antibacterial activities in high concentrations, with aminophylline showing greater ability than caffeine to decrease bacterial growth. However, more studies are needed to investigate the antimicrobial activity of purine compounds and their potential for use in clinical situations. Certainly, present knowledge regarding the characteristics of purine compounds suggest that they could find use as antimicrobials. 1. Ashihara H, Crozier A. Caffeine: A well known but little mentioned compound in plant science. Trends Plant Sci 2001;6:407-13. 2. Ashihara H, Monteriro AM, Gillies FM, Crozier A. Biosynthesis of caffeine in leaves of coffee. Plan Physiol 1996;111:747-53. 3. Brunton LL, Lazo JS, Parker KL. The pharmacological basis of therapeutics. Goodman and Gilmans. 11 th ed. New York: McGraw-Hill; 2006. p. 727-30. 4. Parfitt K. Martindale, the complete drug reference. 32 nd ed. Pharmaceutical Press (PhP), U.S.A. 1999. 5. Barnes PJ. Theophylline in chronic obstructive pulmonary disease. Proc Am Thorac Soc 2005;2:334-9. 6. Sawynok J. Pharmacological rationale for the clinical use of caffeine. Drugs 1995;49:37-50. 7. Yamaoka-Yano DM, Mazzafera. Catabolism of caffeine and purification of a xanthine oxidase responsible for methyluric acids production in Pseudomonas putida L. Revista 1999;30:62 -70. 8. Kawamukai M, Murao K, Utsumi R, Himeno M, Komano T. Cell filamentation in an Escherichia coli K-12 fic mutant caused by theophylline or an adenylate cyclase gene (cya)-containing plasmid. FEMS Microb Lett 1986;34:117-20. 9. Sacks LE, Thompson PA. Increased spore yields of Clostridium perfringens in the presence of methylxanthines. Appl Environ Microbiol 1977;34:189-93. 10. Hosseinzadeh H, Bazzaz BS, Sadati MM. In vitro evaluation of methylxanthines and some antibiotics: Interaction against Staphylococcus aureus and Pseudomonas aeruginosa. Iran Biomed J 2006;10:163-7. 11. Cogo K, Montan MF, Bergamaschi C, Andrade ED, Rosalen PL, Groppo FC. In vitro evaluation of the effect of nicotine, cotinine and caffeine on oral microorganisms. Can J Microbiol 2008;54:501-8. 12. Fleisch F, Zimmermann-Baer U, Zbinden R, Bischoff G, Arlettaz R, Waldvogel K, et al. Three consecutive outbreaks of Serratia marcescens in a neonatal intensive care unit. Clin Infect Dis 2002;34:767-73. 13. Domínguez MC, de la Rosa M, Borobio MV. Application of a spectrophotometric method for the determination of post-antibiotic effect and comparison with viable counts in agar. J Antimicrob Chemother 2001;47:391-8. 14. NCCLS. Methods for dilution antimicrobial susceptibility testing for bacteria that grow aerobically; approved standard-sixth edition. NCCLS document M7-A6. NCCLS, Wayne. Pennsylvania, 2003. 15. Holtzman SG. Caffeine as a model drug of abuse. Trends Pharmacol Sci 1990;11:355-6. 16. Griffiths RR, Juliano LM, Chausmer AL. Principles of addiction medicine. 3 rd ed. American society of addiction medicine; Philadelphia, 2003. p. 193-224. 17. Raj CV, Dhala S. Effect of naturally occurring xanthines on bacteria: 1- antimicrobial action and potentiating effect on antibiotic spectra. Appl Microbiol 1965;13:432-6. 18. Stearne LE, van Boxtel D, Lemmens N, Goessens WH, Mouton JW, Gyssens IC. Comparative study of the effects of ceftizoxime, piperacillin, and piperacillin-tazobactam concentrations on antibacterial activity and selection of antibiotic-resistant mutants of Enterobacter cloacae and Bacteroides fragilis in vitro and in vivo in mixed-infection abscesses. Antimicrob Agents Chemother 2004;48:1688-98. 19. Ikonomidis A, Spanakis N, Poulou A, Pournaras S, Markou F, Tsakris A. Emergence of carbapenem-resistant Enterobacter cloacae carrying VIM-4 metallo-â-lactamase and SHV-2a extended-spectrum â-lactamase in a conjugative plasmid. Microb Drug Resist 2007;13:221-6. 20. Ehrhardt AF, Sanders CC. 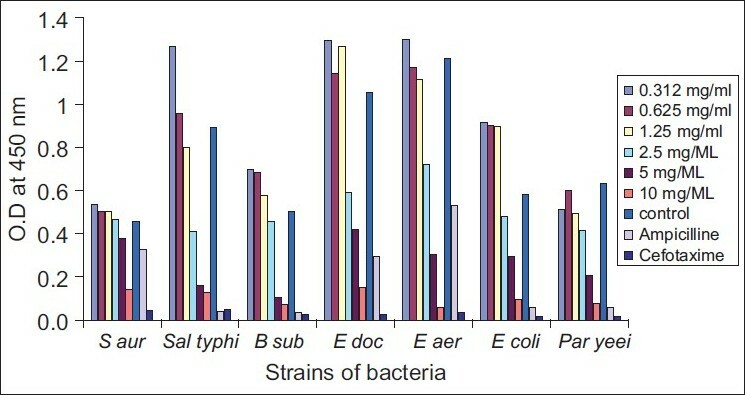 Beta-lactam resistance amongst Enterobacter species. Antimicrob Agents Chemother 1993;32:1-11. 21. Sandlie I, Solberg K, Kleppe K. The effect of caffeine on cell growth and metabolism of thymidine in Escherichia coli. Mutat Res 1980;73:29-41. 22. Selby CP, Sancar A. Molecular mechanisms of DNA repair inhibition by caffeine. Proc Natl Acad Sci U S A 1990;87:3522-5. 23. Banner KH, Page CP. Theophylline and selective phosphodiesterase inhibitors as anti-inflammatory drugs in the treatment of bronchial asthma. Eur Respir J 1995;8:996-1000. 24. Biaggioni I, Paul S, Puckett A, Arzubiaga C. Caffeine and theophylline as adenosine receptor antagonists in humans. J Pharmacol Exp Ther 1991;258:588-93. 25. Ito K, Lim S, Caramori G, Cosio B, Fan Chung K, Adock IM, et al. A molecular mechanism of action of theophylline: Induction of histone deacetylase activity to decrease inflammatory gene expression. Proc Natl Acad Sci U S A 2002;99:8921-6. 26. AL-Janabi AS. Treatment of dermatophytoses by drugs containing some purine compounds. Iraq: Ph.D. Thesis. AL-Mustansiryia Unvi., College of Science; 2004. Petrofsky, J. and Berk, L. and Al-Nakhli, H.
Adamafio, N.A. and Kolawole, O.M. and Oduro-Mensah, D.
Oscar CuÃ©llar, G. and QuÃ­m, T. and Gloria Guerrero, A.